North Dakota police will cut off Standing Rock protesters’ supplies. 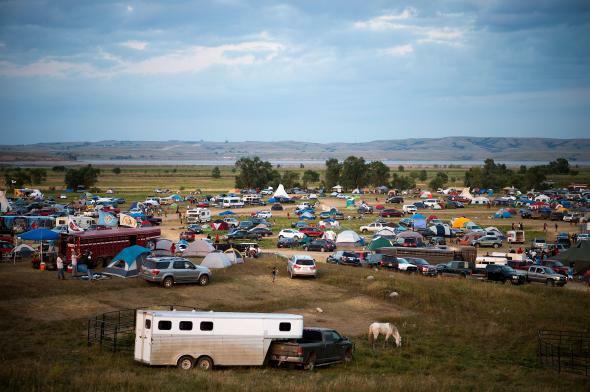 People gather at an encampment by the Missouri River, where hundreds of people have gathered to join the Standing Rock Sioux Tribe’s protest against the construction of the Dakota Access Pipe, near Cannon Ball, North Dakota, on September 3, 2016. When the U.S. Army Corps of Engineers, which manages the site, first set the deadline they stressed that protesters—who believe the pipeline endangers local indigenous communities and their sacred lands, and more broadly threatens the environment—would not be removed by force. The supply blockade is theoretically a more peaceful way to get protesters to depart as winter approaches, but it remains an open question how authorities would respond if anyone tries to deliver supplies against government orders. While the order went into effect immediately, as of Tuesday morning no cars or trucks carrying supplies had yet been turned back, according to the North Dakota Department of Emergency Services. The Dakota Pipeline Protesters Have Gained Momentum. Now They Must Start a Movement. Standing Rock Is Worth More Than the Oil. You Just Can’t Measure It In Dollars.